Concord is the largest city in Cabarrus County with a population of 92,067 and is 60 square miles according to the 2017 Census. In fact, it is the second largest city in the Charlotte Metropolitan area and the 10th largest in the state! Many people choose to live in Concord due to its close proximity to Charlotte. There is also easy access to the major interstates including I-85, I-485 and I-77. Charlotte Douglas International Airport is about 30 minutes away. One of the great things about living in Concord is that you can choose to live out in a more rural setting or you can live close to all the action! The city of Concord has a great page with tons of information you will find helpful to learning more about the city and what it has to offer! 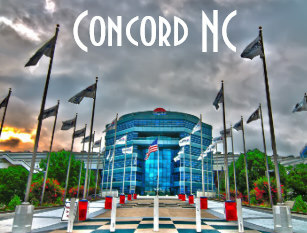 Concord also contains the 2 biggest tourist attractions in the state, one being Concord Mills Mall and the other being Charlotte Motor Speedway. Both are at exit 49 off I-85 along with restaurants, lodging (including Great Wolf Lodge! ), and a public golf course. There is also a movie theatre and NASCAR speedpark (a race-themed amusement park) located at Concord Mills Mall. Concord also has a great historic district with shops, restaurants, a museum, art galleries, library and more. There is plenty to see and do here in Concord, North Carolina!! Concord offers a variety of great restaurants from the big chains to local restaurants & breweries. There are several chain restaurants in the Concord Mills area and some great local eats downtown. There are also local breweries to try as well! Whatever you are craving, you will find it here! Below are just a few you can try! There are many parks and greenways for folks to enjoy whether it’s for a picnic, social gathering, sports, playgrounds and even fishing! Children attend Cabarrus County Schools and there is the option for private schools as well. If you desire certain schools be sure to make sure the neighborhood or area you are looking to live in will feed into the school of your choice. You can call the school department to double check what school your area is assigned to. Click the links below to see school ratings in Concord, Cabarrus County School District page and private and Christian school websites. Located in Concord is Carolinas Medical Center. There is another location in Charlotte’s University area as well. Another nearby facility is Presbyterian Hospital in Huntersville. The City of Concord tax rate is .48 per $100 valuation and the Cabarrus County rate is .72 per $100 valuation. If you live inside city limits that you will pay both city and county taxes.